Keep a cool head with this mesh-back cap that looks great and is comfortable to wear. :: Men > Hats and Caps. Durable. 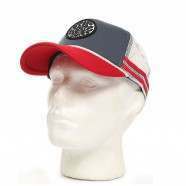 strong constructionMaterial: Cotton and SyntheticMen's trucker hatFlat visor helps keep the sun out of your eyesFabric front-crownMesh back-crownSnapback fasteningIconic branding at the front Size: one size.